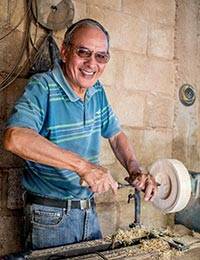 Victor Hugo Lopez is an artisan from Guatemala who specializes in kitchenware. He designs this trivet, which is handcrafted from reclaimed cedar wood in the shape of a delicious apple. Open spaces allow for the passage of air. With a natural finish, this makes a useful and decorative addition to any kitchen.